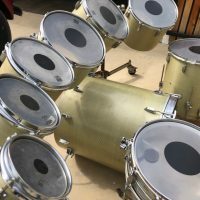 When Howie Oliver and Rick Faucher teamed up to build Hal Blaine’s first Blaemire fiberglass concert tom “Monster Set” in 1969 they didn’t realize they were about to turn the entire drumming world upside down. 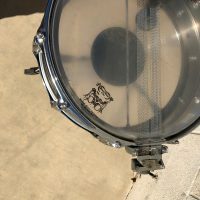 Blaine was the most in demand session drummer in the Los Angeles at the time and before long the set was heard on dozens of top 100 songs by some of the biggest names in in the recording industry. The set inspired a whole era of huge concert tom drum kits and super punchy “epic fills”. Howie Oliver had dozens of requests for Blaemire concert tom sets but only built sets for a select handful of the top drummers in the world. 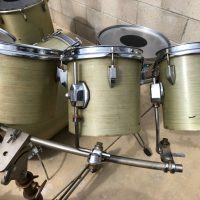 In addition to the drums he made for Hal Blaine, he made sets for Ringo Starr, Karen Carpenter and this 8 piece set built for Dennis Wilson of The Beach Boys. A lot of mystery and speculation surrounded the whereabouts of Wilson’s Blaemires until they re-surfaced a couple years ago in Los Angeles. The set was used at the Beach Boys’ Brothers Studio in Santa Monica, CA from 1974 to 1978. Artists including The Beach Boys, Elton John, The Runaways, Barbara Streisand and Donna Summer recorded at Brothers during this time. Dennis Wilson also recorded his solo album at Brothers in the same period. Little is known about specifically what recordings the set was used on but it’s clear it was used at Brothers Studio until The Beach Boys sold the studio in 1978. At this point the set went to the Beach Boys’ storage warehouse. 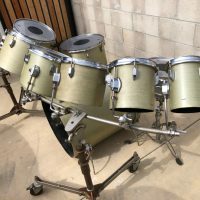 In 1983 the set was given to longtime Beach Boys associate Jason Raphalian. Jason started out with the band as a backline tech in 1972 and worked his way up to Stage Manager, then Production Manager. By the time he retired in 1984 he was the band’s Tour Manager. 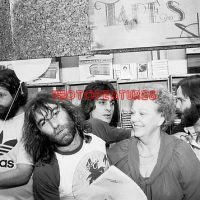 That’s Jason you see in the photo, right behind Dennis Wilson, sporting a rather spectacular 1970s Shag hairdo. 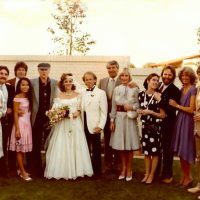 That’s also Jason you see in the far left in Al Jardine’s wedding photo. 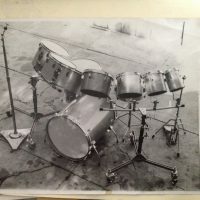 The set originally included seven consecutively larger fiberglass toms as seen in the black and white photo taken during the 1970s. 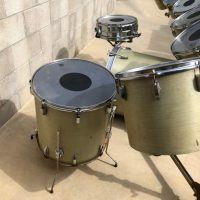 Somewhere along the line the 12″ tom went missing. 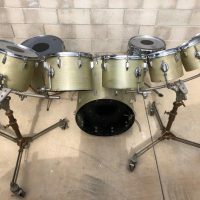 The set currently includes 6, 8, 10, 13, 14 and 15″ concert toms, an 18×18″ floor tom and a 22×24″bass drum. All the drums are painted black on their interiors. The toms are mounted on 2 custom rolling stands that Howie Oliver ingeniously fashioned from Kleig studio light stands. 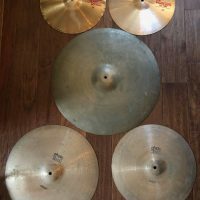 The cymbals include 1970s Paiste 2002 14″ Sound Edge hi-hats, 16″and 18″ 2002 crashes and a 22″ A. Zildjian ride cymbal. 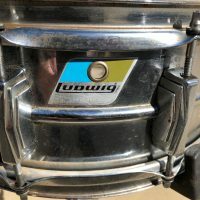 Also included is a 1970s 5×14″ Ludwig Supersensitive snare drum . 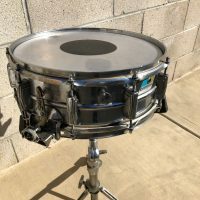 This is a rare opportunity to own a significant piece of Beach Boys and vintage drum history. The set will ship from Los Angeles, CA via crated freight. 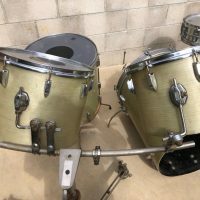 Plan on around $800-$1,000 for shipping in the US. We will ship internationally. Acquired directly from Raphalian. COA signed by Raphalian. Single click image to enlarge. PRICE: $22,495.00. Serious offers considered.